The tank type of freight car was one of the first to utilize iron or steel construction. Wooden construction was not very suited to producing a car design capable of carrying large quantities of liquid. The closest was what was best described as a flatcar with two or more vertical vats. 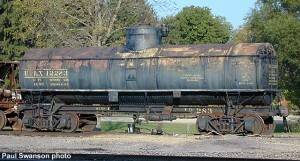 The first horizontal tank car appeared in the late 1860’s. It utilized a traditional wooden flatcar frame with an iron or steel tank strapped on top. The concept of an all-steel freight car had been a far-flung dream. But the tank type car presented the first opportunity to test these waters. A George L. Harvey of Chicago produced a prototype for Standard Oil and its Union Tank Line subsidiary in the early 1890’s. However, steel freight car construction did not become more common until after 1901. UTLX #12283 represents an early all-steel tank car design which integrated a specially-designed frame with the tank structure. In fact, the frame consists solely of a center sill running the length of the car. The tank is support on top of the sill with angled bracing. Wooden walkways are positioned higher up along the tank for train crew use. The tank is of riveted steel design with a dome on top to allow for expansion of contents and collection of vapors. The tank was vented. These basic features are still utilized today. Lima Locomotive & Machine Co. was better known for its Shay-type steam locomotives, but Lima also built freight cars. They entered this field officially in 1892 when the old Lima Car Works was acquired. It is not known when they left the freight car market. Union Tank Line as a subsidiary of Standard Oil Company was in charge of transporting Standard’s oil product. The company owned a fleet of tank cars and oversaw their distribution and transportation, initially exclusively for Standard Oil’s use. In 1891, Union was formed as a separate corporation to dodge the government’s anti-trust efforts. After 1911, it was further split from Standard’s control and now provided transportation to other companies. Over the years, Union grew and evolved, developing all-welded steel tanks, further expanding its lease fleet. Today the company is the largest tank car lessor and one of the largest tank car manufacturers in the United States.